Stilettos Diary: Crunchy Fashion Store Review and Giveaway. Crunchy Fashion Store Review and Giveaway. I have another surprise for all of you. I have had an amazing shopping experience with crunchyfashion.com. I bought the green messenger bag as shown in “Wintery Blues and Yellow shoes” and red colour envelope bag seen in "Leopard love, Military and Lace, Blue Night Falls". 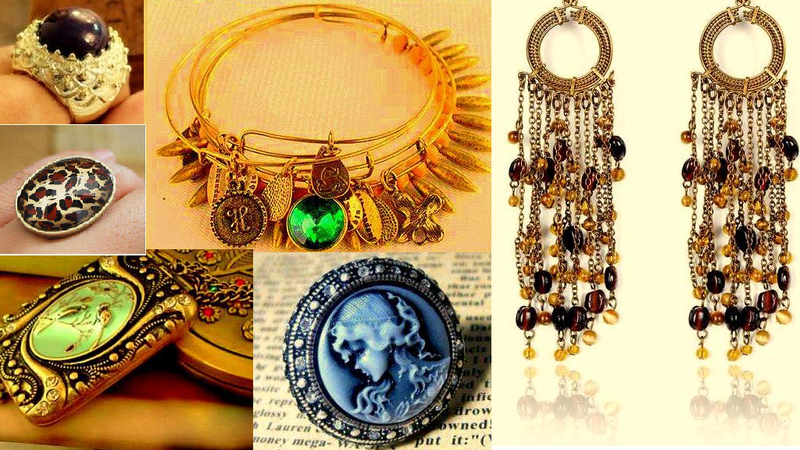 Her collection is unique and echoes vintage in every piece (divine collection for vintage lovers like me). From Vintage Bow rings to vintage charm necklaces, each jewellery has its own charm, individually handpicked to add uniqueness and the best part, all the jewellery on the store are very affordable. My favourite picks from crunchyfashion.com are charming bug ring, one of a kind.Peacock earring, vintage leaf charm necklace perfect statement neckpiece for any outfit.Vintage bow ring – simple and elegant.Charm bracelets – Embellished with pearls. Check out her facebook store for more. Here is few of her amazing collection. I can go on and on about her beautiful collection. But it’s time for you guys to tell what you like about the store. 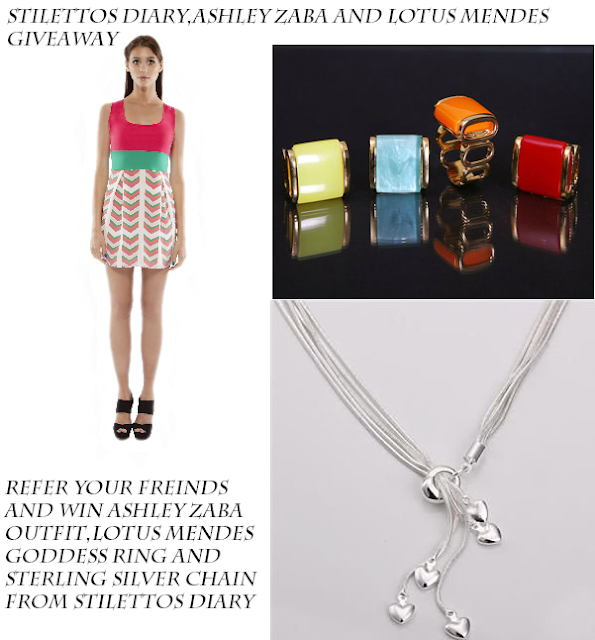 A wonderful giveaway from crunchyfashion.com. WIN THIS STATEMENT CHAIN OR OWL NECKLACE. CHOICE IS YOURS. Open to Residents of India only. All the best guys :) Giveaway ends on April 13th 2012. I love the statement necklace b/c it's a great way to jazz up an outfit! Both the pieces are gorgeous, but I'm partial towards the statement piece. It's the one I would wear more often. Love all your bags lady! Wow love both, especially the green bag, such a pretty colour! I liked d green sachtel..n dat roung ring woth d gurl..!! Me encanta el collar es precioso!! besitos guapa! I love the green shoulder bag! I love the chain necklace that is very original and alternative. Hope I win! Loving the Owl!!! Its perfect to pep up any outfit!!! i loved the statement necklace because it can go with my casual as well as party wear outfits. i have few ethnic dresses and gowns i know it will fit to. its color is also my favorite and black goes with almost every dress. I love the statement chain because I'm going to Vegas at the end of the month and I would TOTALLY wear it if I win! Done!! I lovedd the statement necklace!! it is sooo adorable! m lusting fr a similar kind for some time now..... it is the most trendy thing nowadays! I love all kind of your neclase and I love messenger bag. I Like.. wait scratch that out.. I LOVE the statement necklace mainly because that necklace can make the simplest outfit look so stylish and pretty!! Great giveaway. Thanks! I love both items. They are each great in different ways! I love the chain necklace because it's very elegant! This is a really hard choice... i Love everything Owls... but that chain necklace is gorgeous!!!! I might go with the owl b.c i would wea that more.. but the other necklace would be great for a birthday present for my sister!! I really adore the vintage leaf charm necklace. No statement will be worth making without the statement necklace! I would go with the statement necklace..Its classy and would look great with all sort of clothes..i personally have a collection of elegant necklaces and its going to be my favorite amongst them :) would love to flaunt it..It would jazz up even the plainest of clothes!! I love the chain necklace. It looks classy and will go with my new coral dress a bought for my friend wedding. I love the statement chain because it is one of those pieces that you can wear to make a more formal outfit a little more edgy glamorous or you can wear it with a t-shirt and make it more fab! Thanks for the giveaway,I simply love the statement chain,surely the one who wears it,will get heads turned to her.Simply classy & elegant statement piece.Would love to win it,to share with my younger sister,she loves jewellery. nice n different giveaway.. luved the statement neckpiece as i already own an owl 1.. i luved the piece.. I'm loving the necklace because of its vintage feel and overall bling factor. It'll glam up any outfit. Statement necklace is very stylish. Its so elegant and contemporary...... I hope i win it...i just loved it.... !!!! i loved the statement chain coz it is a style statement in itself !!!! hello megha,i'd like to say right at the beginning how much i liked your blog, STILETTOS DIARY. I mean i have charm bracelets and they are dearer than almost everything else i have,but whoa,a charm neckpiece,wait,rather,a 'vintage leaf charm neckpiece' is something that caught my eye,attention,concentration.This piece of art(i'd call it) made me sit up n take note,n when i saw u wanted me to tell u what i liked,i couldnt have been happier sharing it.The name in itself speaks a thousand words about it,let alone what the picture does!Its an example of elegance,brilliance,creativity,sophistication!OH yes,i mean all of it! Trust me,the moment i saw it i knew,how well it'd go with my clothes! hey where will u announce the winner?and when? hey rhitima.. the results will be announced on sunday...its extended for 3 days..
i loved the statement chain....Its perfect for an evening event...just elegant and beautiful !!! !